This lovely peppermint stick cocoa recipe is not only a great treat but, also makes for a spectacular Christmas gift in a jar. No matter what part of the world you’re in or what time of day it is, take the next twenty minutes off and snuggle in with a big hot cup of this delicious mint cocoa. I’m sharing the ultimate peppermint stick cocoa recipe with you today that not only promises a great treat but also makes for a spectacular Christmas gift in a jar. The recipe I’ve shared below will fit in a 1 quart jar. For every cup of water/milk you need 1/3 cup of the mixture. The rest should be stored in an airtight container. A full jar will give you about 12 servings. I made these in small individual glass containers where the mixture is just perfect for an individual treat. I recommend warming the milk or water properly on the stove. This will ensure that the chocolate bits and peppermint dissolve easily. And to take it a notch higher – treat yourself with a few marshmallows on top. Doesn’t this make for a nice, custom gift for Christmas? Unless of course you’re tempted to have it yourself. While a steaming hot cup is reward in itself, I recommend some sour cream doughnut holes or freshly baked cookies along with it. 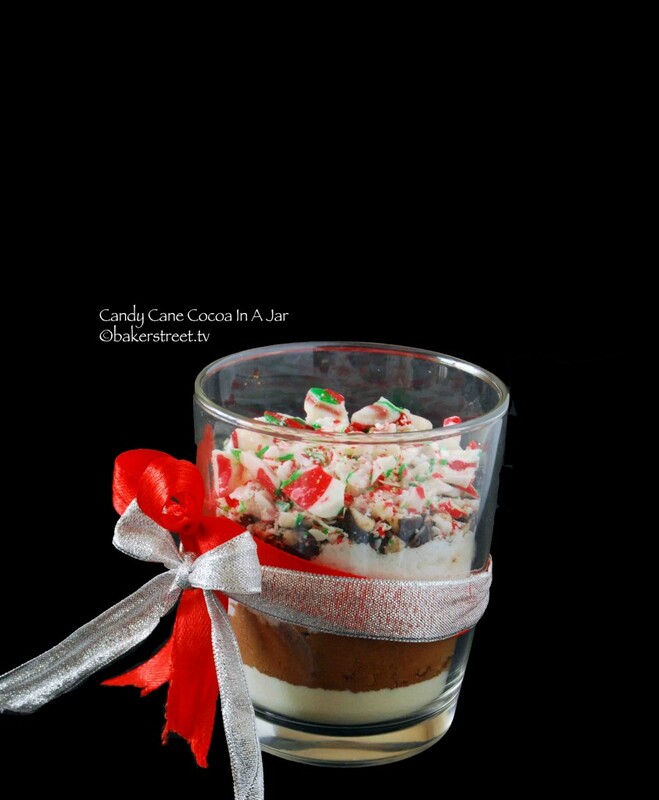 A gorgeous candy cane cocoa served in a jar, topped with peppermint candy. In a 1 Quart Jar layer the ingredients in the following order - powdered milk, cocoa powder, sugar, salt, chocolate chips, and peppermint candy. Mix contents in a large bowl. For each serving, place ⅓ cup cocoa mix in a mug and stir in 1 cup boiling water. Anuradha Sharma was born, raised and is currently living in India. She is a television industry executive by day and a baker by night. Her blog, Baker Street chronicles her kitchen escapades. She pioneered the Muffin Monday movement - her journey to make the world smile and beat glum Monday mornings week after week, one muffin at a time. She has no formal culinary background, but baking is a passion that defines her, for all the joy it gives her and those close to her.